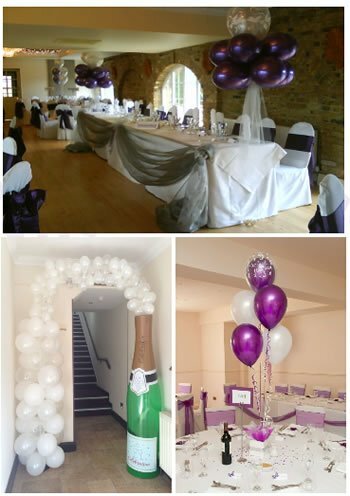 Balloon Decor specialise in on the day wedding planning and elegant wedding decor in Essex to help create your dream day. We love our work and we know this is reflected in our quality of design and service. Our warm and friendly approach has supported many brides through what can sometimes be a stressful time. We always work to the highest possible standards and pay extra special attention to finishing touches and the smallest details that create the uniqueness to make your decor one of a kind. Through an initial free, no obligation consultation, when ideas are exchanged and expectations discussed, we will ensure that you get exactly what you want on your wedding day. From the full decor package to the finishing touch or helping organise the set up of your own centrepieces or decor, we cover it all. "We pride ourselves in helping you decide the right style for you and your chosen venue whatever the budget." Our professional service and commitment to high standards of quality, come highly recommended by many venues including Stock Brook Manor, Friern Manor, The Old Rectory, Pontlands Park, Best Western Ivy Hill Hotel and Holiday Inn, Basildon, as well as countless brides who have used our services and know how crucial it is to entrust the right company with such an important task.